SKU: 50133. Categories: Automotive, Fiberglass, Plastic/Composite/PVC, Rubber, Speciality Products. Plastic Bonder is a quick-setting, two-part, urethane adhesive system that provides strong and lasting repairs and works on thermoset, carbon fiber composites, thermoplastics, coated metals, concrete & more. 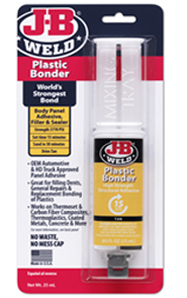 Plastic Bonder has a 1:1 mixing ratio, sets in 15 minutes and can be sanded after 30 minutes. With a tensile strength of 3770 PSI, Plastic Bonder sets to a tan color and cures to a hard, permanent bond. Mix: After removing the replaceable cap, press down on plunger and squeeze equal amounts onto a disposable surface and mix thoroughly. Apply: Apply with appropriate tool in an even coat, weld bead or extruded shape as needed. Dry: Sets in 15 minutes. Cures in 30 minutes. If temperature is below 40ºF, then set time is longer. * For best results use a detergent or degreaser to first clean the surface, then roughen surface with file or coarse sandpaper to provide the best repair.